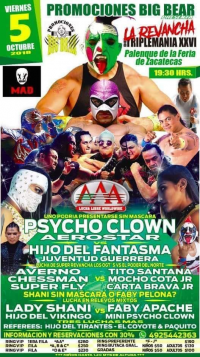 4) Averno & Súper Fly vs Carta Brava Jr. & Mocho Cota Jr. 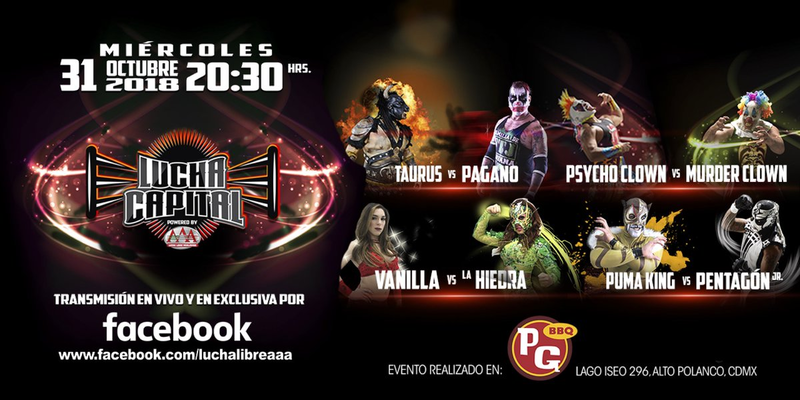 Vanilla replaced Faby Apache. 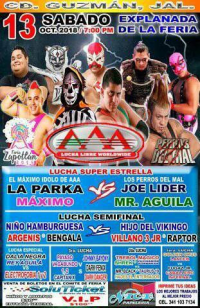 4th defense (only 2 TV). 6) La Parka & Psycho Clown b Hijo del Fantasma & Texano Jr.
Shani & Apache were able to get along. 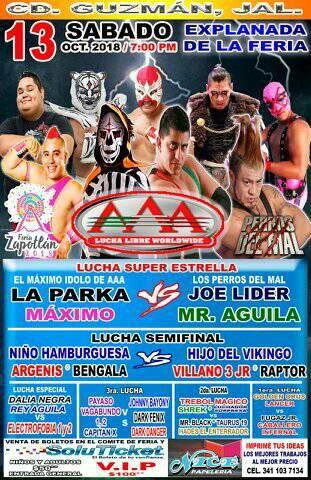 Aerostar & Drago had more problems leading to their defeat. 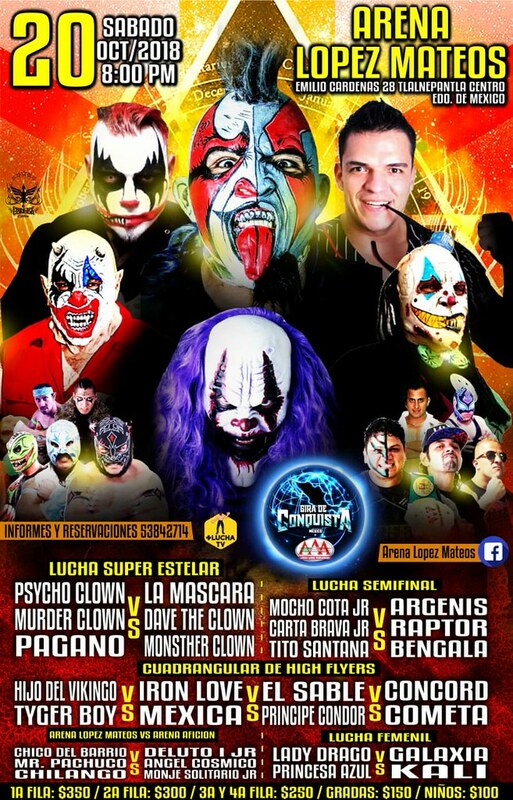 Texano & Escorpion confronted Mexablood after the match, talking about their title match on 10/28. 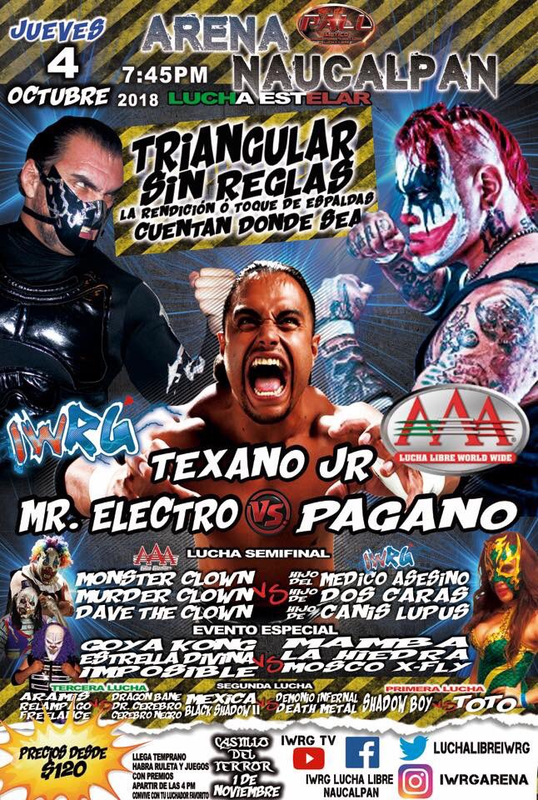 Emperador Azteca replaced Teddy Hart. 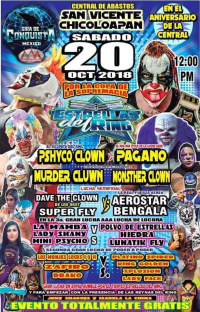 Fantasma beat Electroshock after a foul. 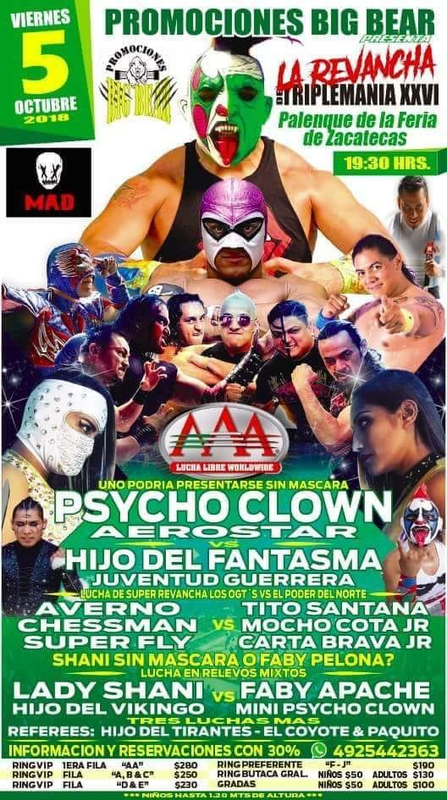 This gave AAA a 3-1 over Elite. 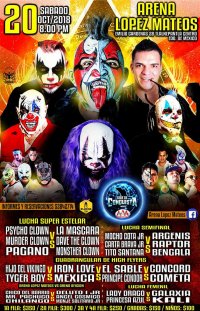 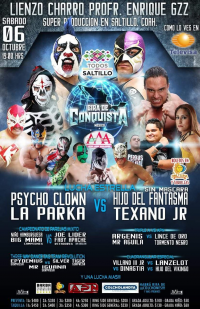 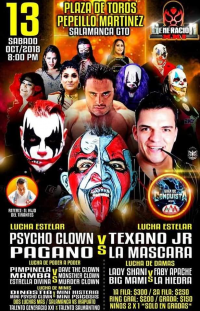 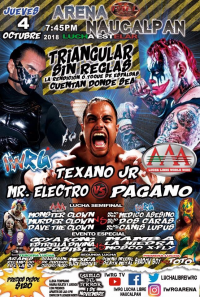 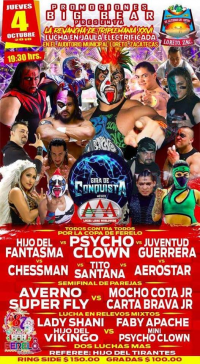 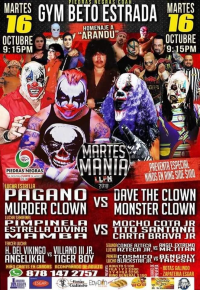 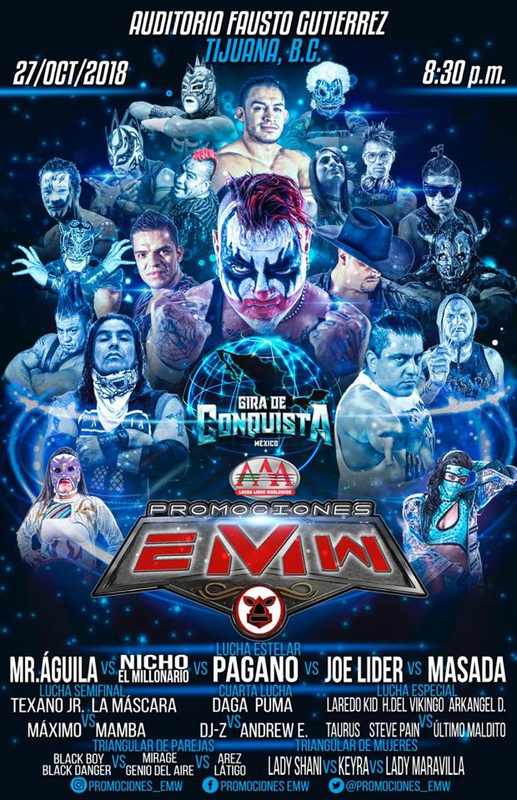 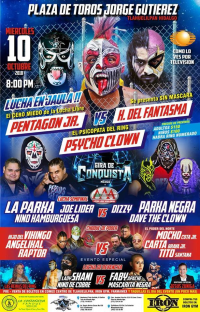 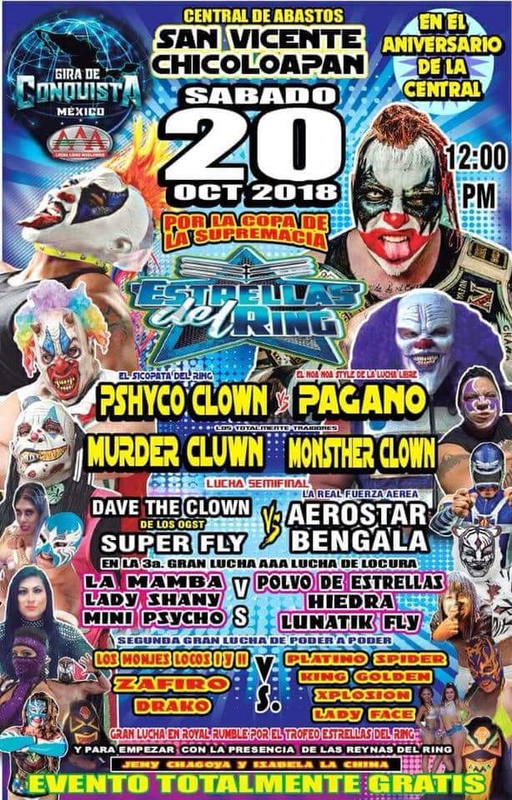 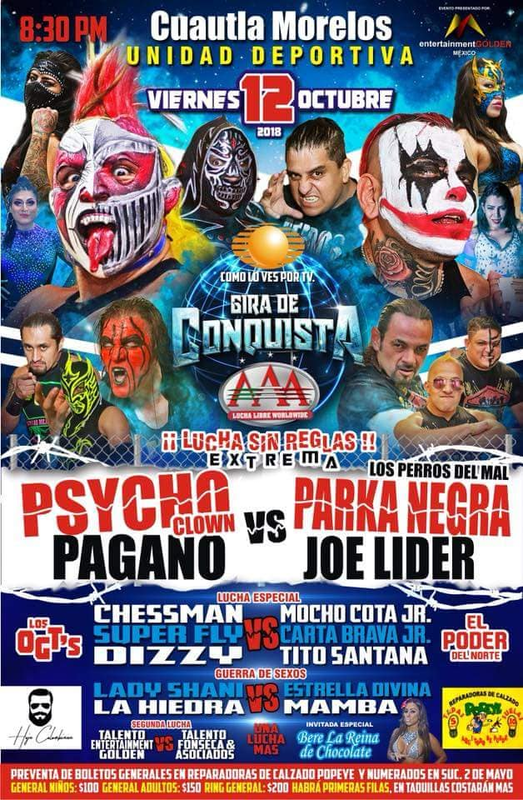 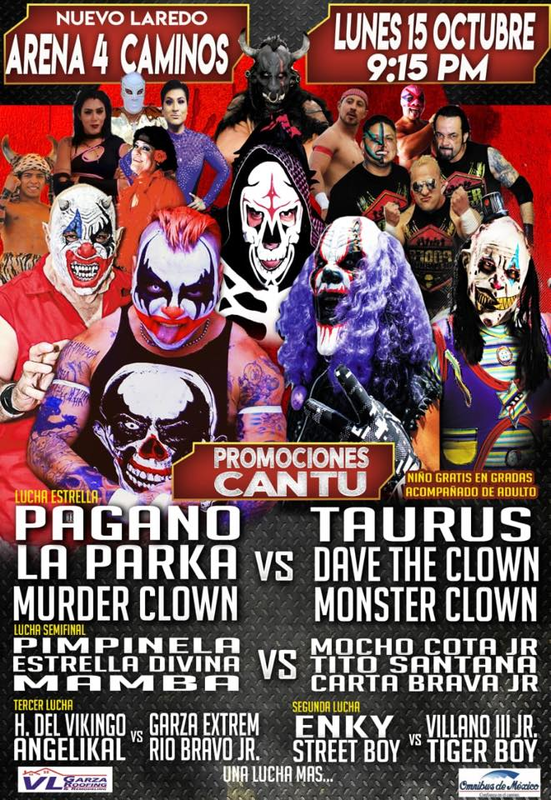 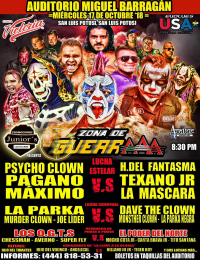 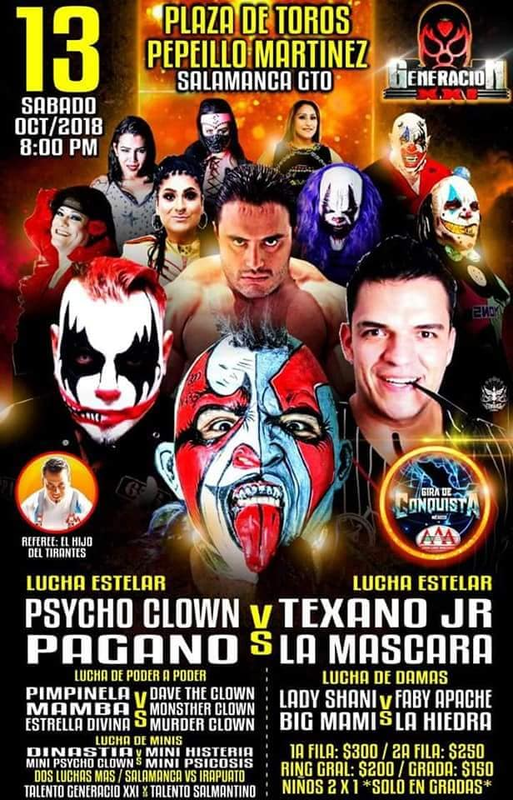 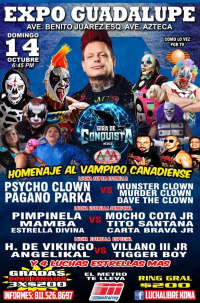 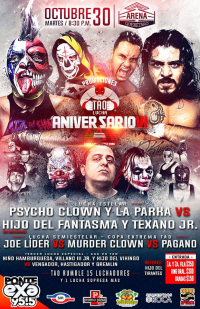 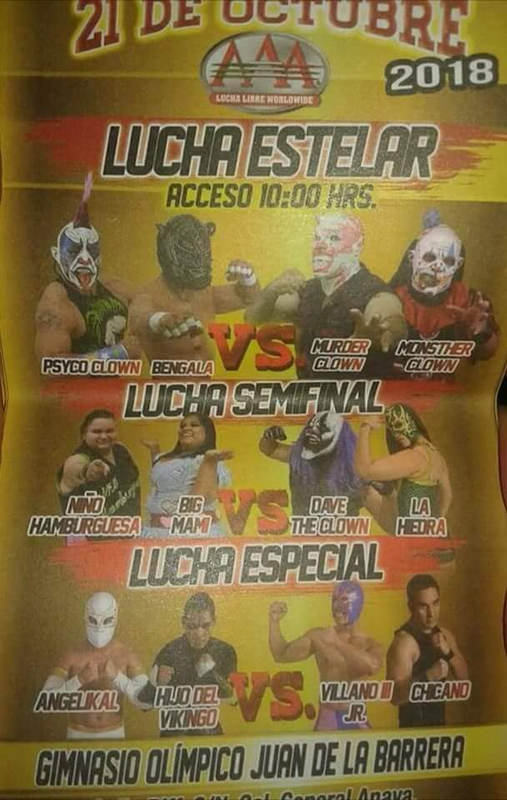 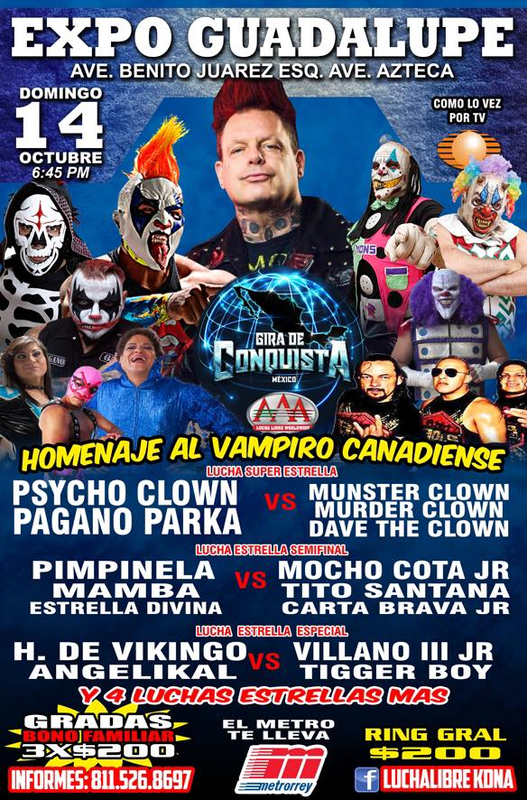 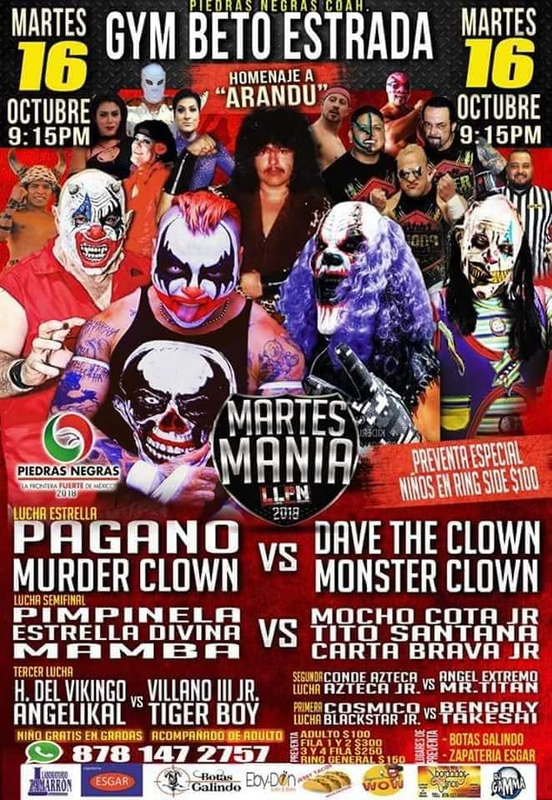 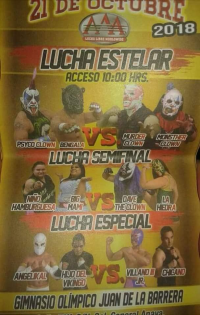 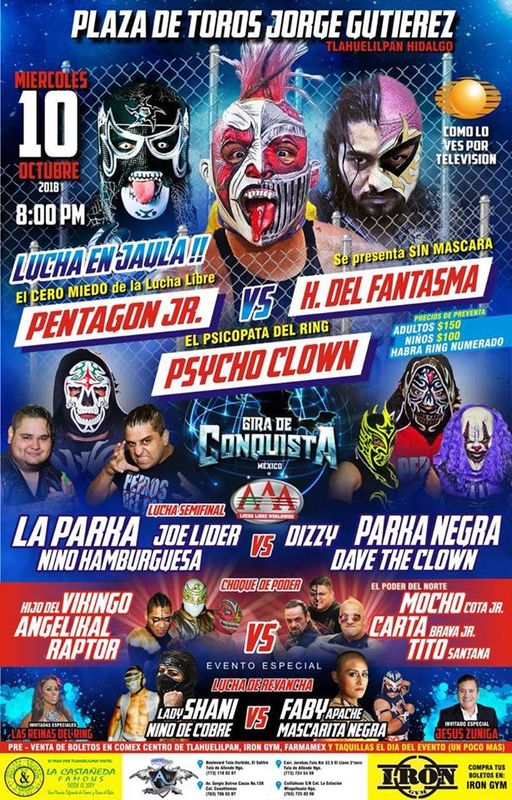 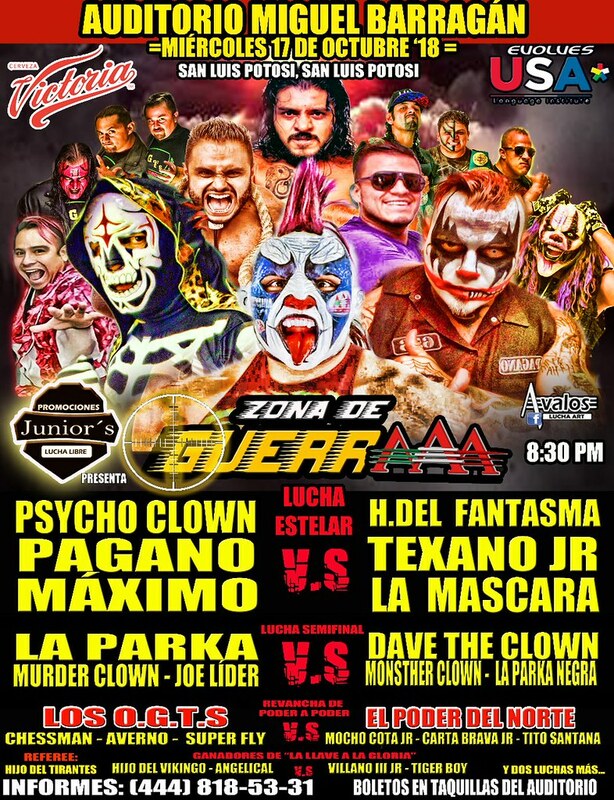 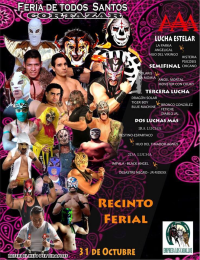 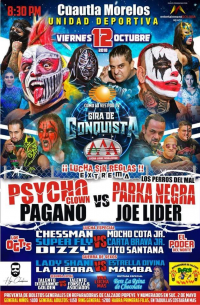 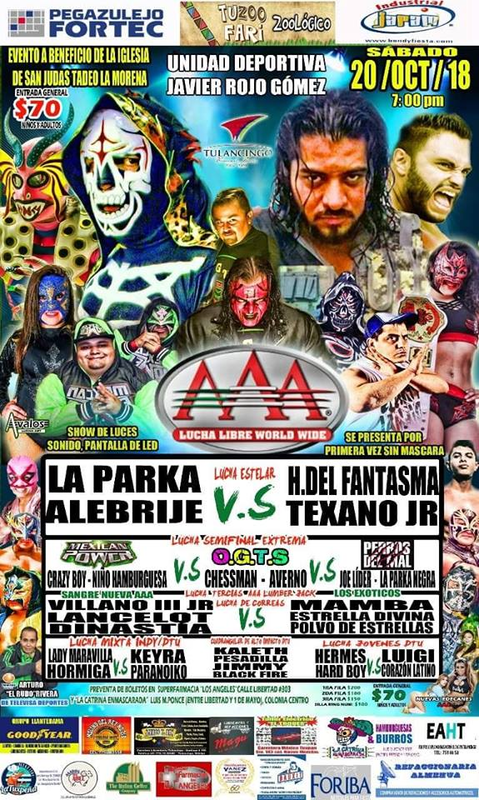 6) Psycho Clown b Fénix, Pagano, Pentagón Jr.
1) Golden Orus & Lancer vs Caballero Infernal & Fugaz Jr.
5) Argenis, Bengala, Niño Hamburguesa vs Hijo Del Vikingo, Raptor, Villano III Jr.
5) Angelikal & Hijo Del Vikingo vs Tigger Boy & Villano III Jr.
1) Angelikal & Hijo Del Vikingo vs Tiger Boy & Villano III Jr.
4) Máximo, Pagano, Psycho Clown vs Hijo del Fantasma, La Máscara, Texano Jr.
4) La Parka & Psycho Clown vs Parka Negra & Texano Jr.
Tito Santana was shaken up after Jack didn't much catch him on a dive. 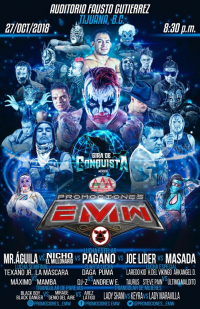 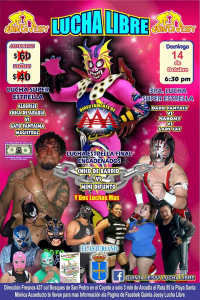 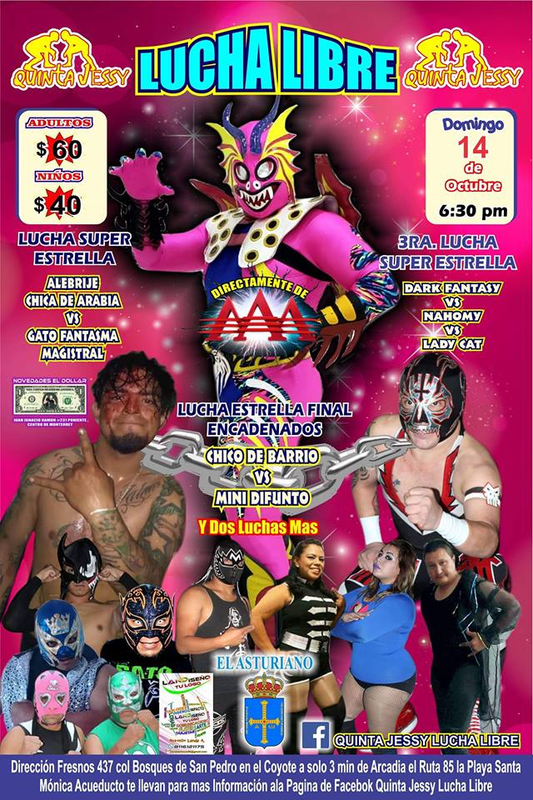 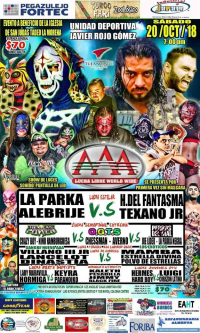 4) Chessman & Mamba vs La Máscara & Texano Jr.
1) Angelikal & Hijo Del Vikingo vs Chicano & Villano III Jr.
Keyra & Maravilla attacked Shani after, with Mamba making the save. 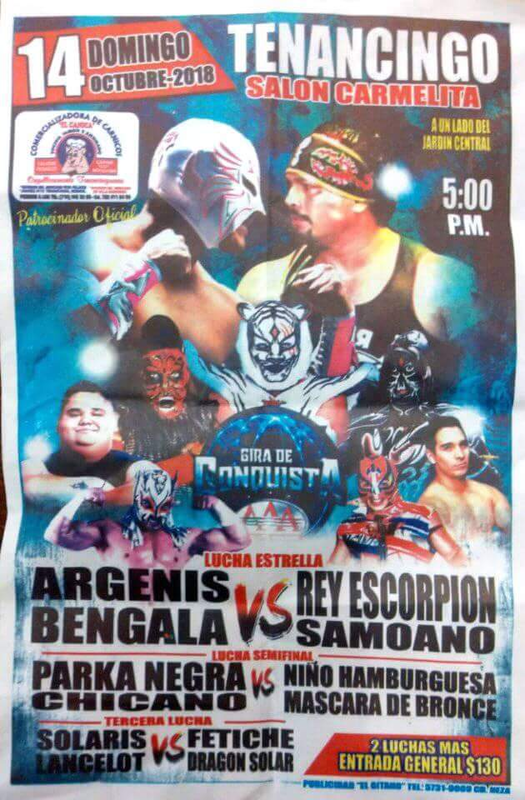 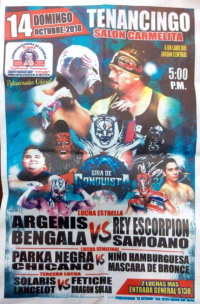 Rey Escorpion interfered for the DQ. 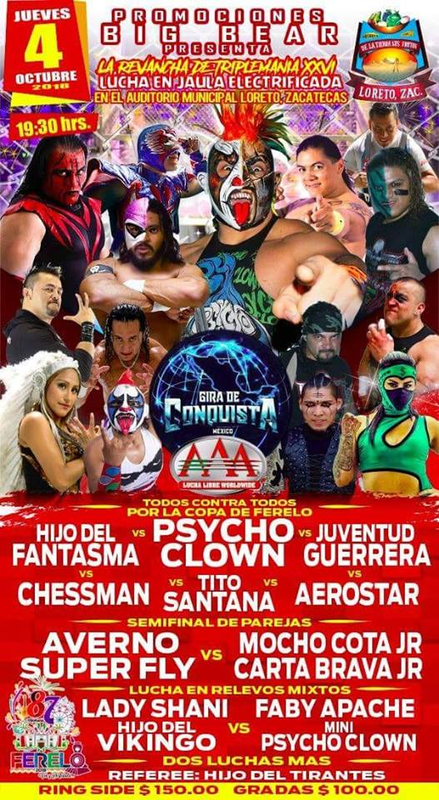 3) Gremlin, Kastigador, Vengador b Hijo Del Vikingo, Niño Hamburguesa, Villano III Jr.
Kastigadro beat Villano III Jr.